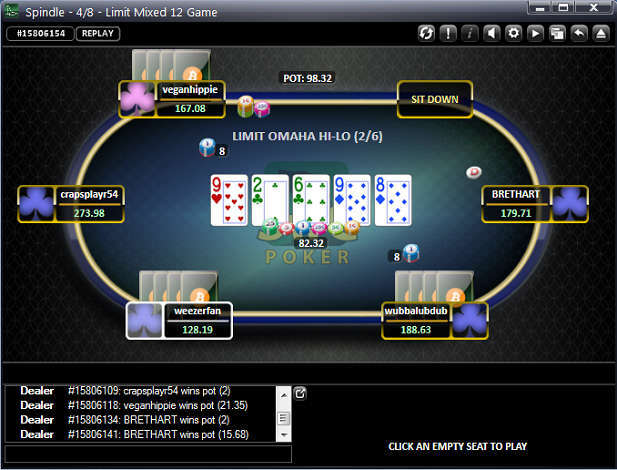 Where to Find Online Limit Omaha Poker in the U.S.A. Although Omaha limit poker doesn’t get as much attention as its big-bet brother, Pot Limit Omaha, it’s nevertheless a fun game to play as long as you have decent starting hand criteria. It’s not uncommon for medium-stakes, live Omaha hi/lo to feature plenty of players drawing thin or dead both ways, basically handing their chips over en masse to their more skilled opponents. If you’re an American who would like the opportunity to play Omaha online poker in fixed-limit form, then we’re here to show you how. Before we proceed any further, let’s get one thing out of the way. Throughout the remainder of this article, we’ll be speaking exclusively of Omaha online poker with a split pot, not limit Omaha played for high only. Though Texas Hold’em high is played in both NL and FL formats, Omaha high can only be really found in PL or sometimes NL betting structures. Even at sites that offer limit Omaha high, there’s nary a table with players seated at it. Split-pot Omaha, however, is common in all three varieties: PL, NL, and limit. 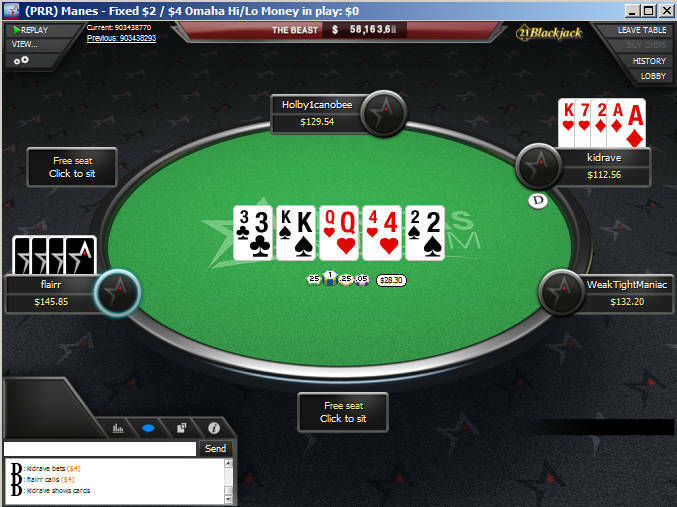 It is the limit poker type of Omaha hi/lo that concerns us today. We’ve gone through the ranks of U.S. online poker sites and have observed their traffic patterns to come up with a shortlist of places to play Omaha hi/lo. Be warned that there aren’t tons of tables going, so you’ll have to settle for what you can get. It’s pretty helpful if you can table start and play heads-up for a while until your table fills up. The Omaha/8 tables at Ignition Poker go from $0.25/$0.50 all the way up to $30/$60 at six- and nine-handed tables. Up until recently, this was – bar none – the premier destination for limit poker action at micro stakes all the way up through high stakes, which actually ran pretty regularly. With the introduction of the Quick Seat feature, it’s harder to fill games because everyone must enter in the exact table size and stakes they’re looking for rather than participating in whatever games happen to be active. Time will tell how this affects LO8 traffic in the long term. For now, you’ll see yourself placed at a lot of empty tables. We recommend opening up three tables at a time at varying blind levels, and using a fourth table to cycle through other possibilities until another player joins one of your games. Alas, you can’t open more than four cash game poker tables simultaneously at Ignition; otherwise, you could just Quick Seat yourself into all possible Omaha hi-lo stakes/table sizes and then close most of them when games start at a few. When you create an account at Ignition Poker, you’ll get a 100% up to $1,000 poker bonus. It’s basically a 30% rakeback bonus if you max it out at the full $1,000 value, but it’s worth a bit more percentagewise if you instead deposit less. 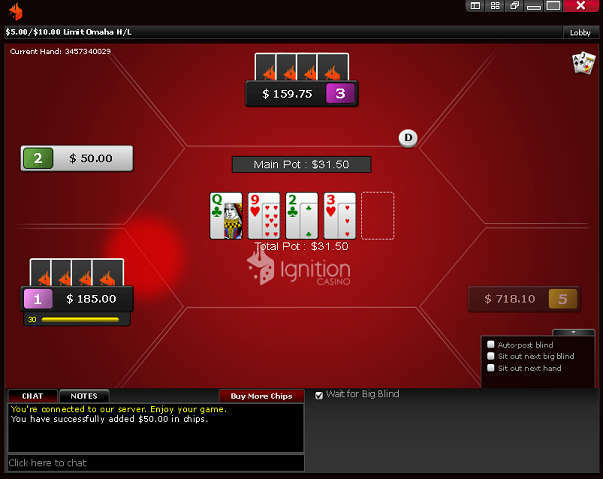 Read our Ignition Poker review for all the details. America’s Cardroom, on the Winning Poker Network, hosts LO/8 tables from $0.02/$0.04 to $75/$150. Your options as far as seats per table are restricted to either two or six. Most of the time, there’s only a table or two with cards being dealt, but they could be for nano stakes, small stakes, medium stakes or high stakes. While watching the Omaha Hi/Lo section of the ACR poker software over time, we noticed action across the entire range of blind levels present, but the most popular are the games denominated between $1/$2 and $3/$6. The higher up you go in stakes, the more likely it is that there will be only two or three players seated. At Americas Cardroom, you can choose between a straight 27% rakeback deal or opt for the Elite Benefits rewards program instead. Whichever one you choose, you’ll be able to supplement your profit with a 100% up to $1,000 bonus – worth an extra 20% rakeback – and $50 free to use in Jackpot Poker SNGs. Check out our review of Americas Cardroom to learn more about the reasons for playing here. If you’re a fan of other unusual poker games, then SwC will allow you to hone your LO-8 skills while partaking in the variants you enjoy. There are almost always just a few or even zero tables running, but if you’re willing to start new games, you’ll get to receive 50% rakeback for your heads-up and three-handed play. The Krill rewards system is good for up to 50% more if you can climb to the highest level. Interested in playing Omaha online poker for bitcoins? Go through our comprehensive SwCPoker page to educate yourself on the benefits of this online poker site. Unlike with most poker games, we actually have a pretty good idea of who invented Omaha hi-lo: professional gambler Robert “Chip Burner” Turner. Now, we can’t be certain for sure that it had never appeared anywhere else in home games before, but he definitely was the one to introduce it (and Omaha high) to brick-and-mortar casinos in the ‘80s. Starting in the late ‘70s, Turner worked as the poker host at the Golden Nugget in Vegas for Bill Boyd, the director of operations. Just before the 1982 WSOP, he started reminiscing with a friend on their experiences in non-standard poker games, and they both agreed that four hole cards were more fun than just two. Robert pitched the idea of spreading Omaha (for high only) at the Golden Nugget to his boss. After a few hours and a phone call to Nevada’s Gaming Control Board, they were in action. The game filled and ran for 30 days straight perhaps due to curiosity from busted WSOP tournament players. It became a regular fixture at the Golden Nugget with $2/$4 blinds and was called “Nugget Hold’em.” Obviously, the name has changed, but the basic premise of the game has remained constant for more than 30 years. After moving to the Horseshoe card club in Gardena, California, Turner pioneered the split-pot form of limit Omaha poker. It was a game with $1/$2 blinds and alternating rounds of Omaha high and Omaha hi/lo. People today mostly prefer to play Omaha high in big-bet format and O8 for fixed-limit stakes, and so this alternating rounds scheme isn’t really found in Omaha poker games anymore.